Overlooking Palma�s sweeping bay, Nakar Hotel�s eighth-floor restaurant and bar CUIT is a love letter to �Urban Majorquine� cuisine and produce. 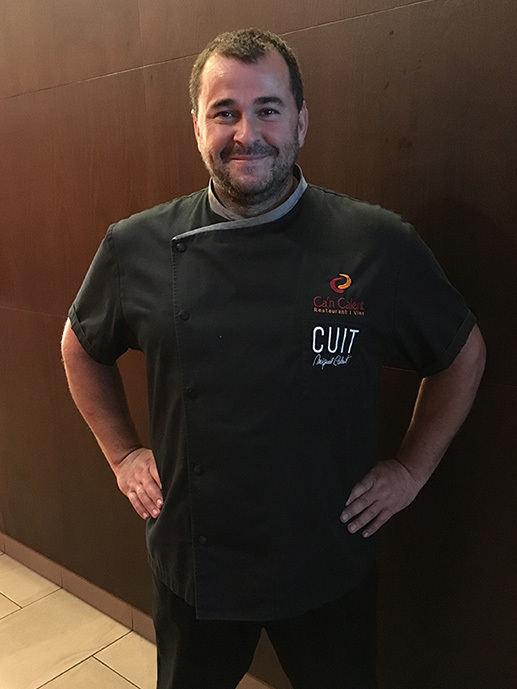 Overseen by renowned Mallorcan chef, Miquel Calent, the varied menu celebrates locally sourced and organic ingredients, while breathing new life into traditional recipes sourced from all corners of the island. Dishes such as monkfish with Mallorcan almonds are complemented by a carefully curated collection of Spanish wines. A small tapas menu is also available at the bar and poolside. 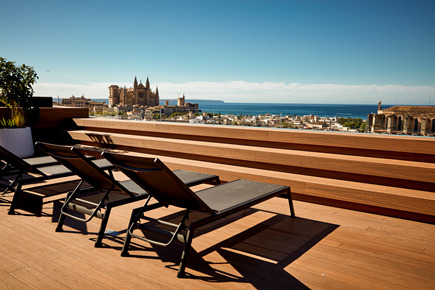 CUTT overlooks the historic center, Cathedral, Bellver Castel ad the bay of Palma. Guests can follow the church bells to the waterfront 13th-century Palma Cathedral, while the beaches of Ciudad Jard�n and Can Pastilla are only a 15-minute walk away. Taking things up a level, the rooftop sundeck and pool is exclusively for residents during the daytime hours. However, sundowners come with an open invitation to the neighborhood, transforming the terrace into one of the city�s hottest haunts for guests and locals alike. With panoramic views over the gargoyle-studded architecture of the city�s old town, the infinity pool provides the ideal setting in which to soak up the ambrosial musical stylings of renowned DJ Toni Jimenez at one of his weekly sets. When indulging in the eternal cocktail hour of the Balearics becomes a little too much like hard work, the hotel�s spa is perfectly placed to ease away the strains of everyday life. The subterranean space includes an indoor pool, the only one in Palma�s Old Town, steam bath, sauna, and two massage rooms. Treatments using a holistic range of products by Comfort Zone include the �Aromasoul Mediterranea� and �Algae Facial�.Restaurant at Nakar Hotel: �CUIT Bar and Restaurant� run by the renowned Mallorcan chef Miquel Calent. The restaurant serves locally sourced, organic Majorquine cuisine. The restaurant and bar are located on the 8th floor, with a view over the historic centre, Cathedral, Bellver Castel and the bay of Palma. Ideally located on the chic shopping precinct of Jaime III Avenue, the Nacar building has been managed by Ramis� family for three generations, and has undergone a renaissance with each generational change. The latest incarnation pays tribute to the spirit of the original Pension Nacar, while embodying the zeitgeist of modern day Palma. 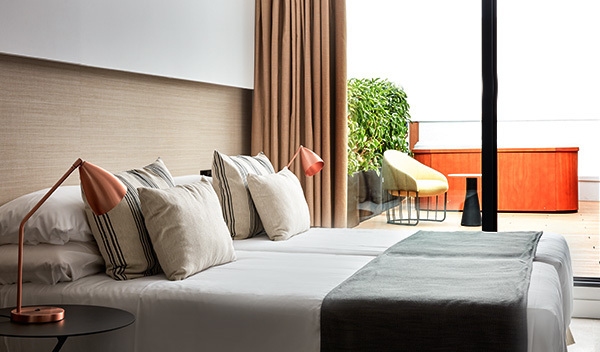 Together with acclaimed architect Magi Margu�s and designer Marga Rotger, Ramis has created a bold new lifestyle boutique hotel that blends sophisticated design with local flavor. Locally sourced oak and stone contrasts with industrial tones of black-lacquered iron and glass in the light and airy public spaces, while the aesthetics of the rooms and suites are defined by earth-tone fabrics and a neutral color palette. Thoughtfully designed with the modern traveler in mind, guestrooms have been outfitted with state of the art media systems including screen-mirroring AppleTV, which are Netflix and Spotify enabled, Nespresso machines, and spacious bathrooms with luxurious Molton Brown amenities. While in-room Jacuzzis and private terraces lend the Deluxe Rooms more than a little romance. 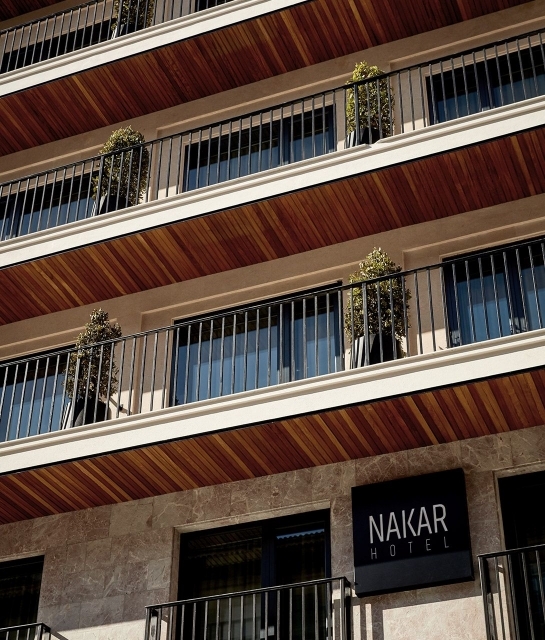 designhotels.com/nakar. Rising from a rock dominated by Mount Camicia is a small village set between the Rio and Leomogna rivers. Its beauty and the friendliness of the locals make it a favorite destination place for tourists. It is home of the Art Institute and a fascinating Ceramics Museum, and is located on the eastern side of the Gran Sasso. Teramo has existed since pre-Roman times, and in the XI century flourished under the influence of the Benedictine Abbey of San Salvatore. The monks introduced the local people to ceramics, and since the XVI century has been acclaimed by the Grue Brothers, Gentili, and Pompei families, who are considered masters in the art of ceramics. Elegant dinnerware by Castelli was commissioned by noble families, including the Aragona, Orsini, Farnese and others. Archeological research is ongoing in this area, and the Museo del le ceramiche is located in the cloister of an ancient convent just outside the town. The San Giovanni Battista contains a XII century wooden statue of St. Anne and XVII century ceramics works. Frescos by renowned Italian artists are also visible in many of the local village venues. This is an exquisite area to visit, especially if you enjoy climbing and feeling one with nature. In August there are to major events for tourist enjoyment: August 15 features the Lancio del piatto on the river Leomogna, and it is a traditional popular game that Italians enjoy. The second is a festival that runs from August 1-31 August a Castelli, a Market Fair of traditional ceramics along the streets of the village. This lovely Castelli village area is also home of Simonetti Ceramics, a place of business that was a perfect spot for a quick visit to watch craftsmen at work creatin g their beautiful and artistic designs before our eyes. From medieval fortresses to crystal museums, magnificent castles and places of religious pilgrimage, Bavaria has it all and more. The state�s numerous vacation routes provide visitors with an extensive network of tourist routes and itineraries linking some of Bavaria�s most appealing and interesting sites. Still deep in the Franconian countryside is the town of Bayreuth famous for its annual Wagner Festival in the baroque opera house funded by none other than the famous King Ludwig of Neuschwanstein fame. 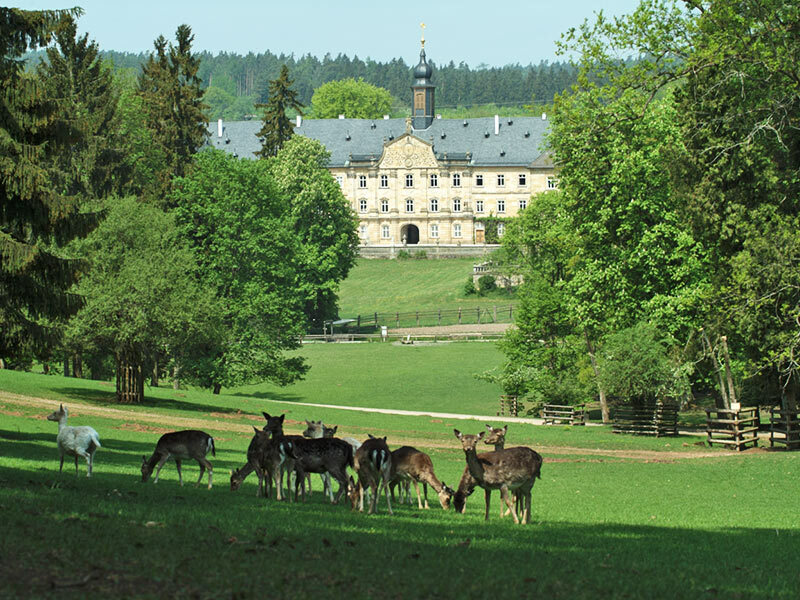 In Bayreuth, the gardens, courtyard, and the orangerie of the Hermitage and the Old Palace form one of Germany�s top gardens. 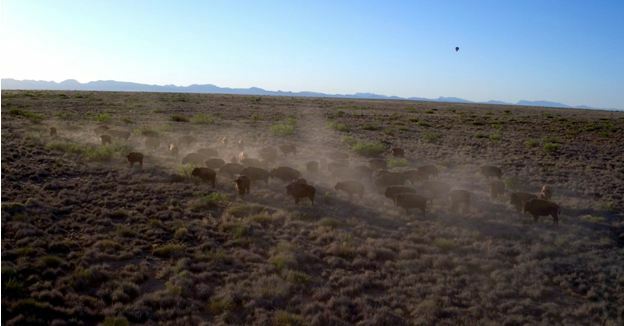 Ted Turner Expeditions, the newly launched eco-adventure and hospitality company, has announced the addition of hot air balloon tours over Armendaris Ranch in southern New Mexico to its growing list of activities for visitors. Many American landscapes have been compared to the Serengeti, but the Armendaris Ranch, with its 360,000 acres of wild Chihuahuan desert and own mountain range, the Fra Cristobals, could easily be mistaken for this iconic destination. Home to Ted Turner's bison herds, big horn sheep, African Oryx and mountain lion, among others, the ranch is larger than Canyonlands National Park, and is accessible only to Ted Turner Expeditions guests. Guests participating in the new ballooning adventure will depart from their home base of Sierra Grande Lodge & Spa in Truth or Consequences (located between Ted Turner's Armendaris and Ladder Ranches) in the early morning, arriving at Armendaris Ranch at dawn to view the first rays of sunlight striking the jagged Fra Cristobal crest, while the expert pilot and ground crew inflate the balloon and ready the gondola. Once in the air, participants will float over the sprawling Armendaris Ranch with the chance to spot wildlife and survey the desert flora. In the distance, guests can see the historic El Camino Real Trail and Elephant Butte Lake. Each hot air balloon adventure will end with a traditional Champagne toast and light continental breakfast. The Armendaris Balloon Adventures are priced from $2,000 for one to four passengers. Additional Ted Turner Expeditions offerings in Truth or Consequences and at Armendaris and Ladder Ranches include hiking, mountain biking, visits to Spaceport America, paleontology and photography tours, spa treatments, hot spring soaks, viewing the seasonal bat flight and more. For more information about the Armendaris Balloon Adventures and Ted Turner Expeditions, visit www.tedturnerexpeditions.com or call 1-877-2TURNER. Introduced in 2015, Ted Turner Expeditions' (TTX) eco-conscious journeys are individually crafted and tailored to their specific North American locales: Turner's Ladder, Armendaris and Vermejo ranches and Sierra Grande Lodge & Spa in New Mexico, and St. Phillips Island off the coast of South Carolina. These unique adventures are intended to deliver insightful and exhilarating experiences, while also providing extraordinary guest service. Ted Turner Expeditions is committed to making a difference by inspiring individual action to preserve the integrity of our earth and the creatures that inhabit it. Vienna recorded around 6.6 million visitor bednights between January and June 2016 � about 4.9% more than in the same period the previous year. �Vienna demonstrated its tourist attraction in the first half of 2016 with an increase of 4.9% to some 6,640,000 visitor bednights,� according to Norbert Kettner, the Vienna Tourist Board's director. Vienna's most important source markets in the first half of 2016 were Germany with 1,382,000 bednights (+8% on the same period the previous year), followed by Austria (1,370,000, +10%), the USA (367,000, +6%), Italy (316,000, -4%), and the United Kingdom (295,000, +24%). Places 6 to 10 were taken by Switzerland (213,000, +2%), Spain (177,000, +13%), France (173,000, +5%), Russia (157,000, -28%) and China (121,000, +9%). The city also recorded strong growth compared to 2015 from India (56,000, +39%), the Netherlands (111,000, +16%) and Turkey (80,000, +13%). Vienna currently has about 63,400 hotel beds, and its hotel rooms had an average occupancy rate of 67% from January to June 2016. Around 80% of all bednights were accounted for by international guests. �This not only reflects Vienna's continued attractiveness, but also shows that our systematic internationalization strategy of diversifying into many different markets is paying off,� explains Kettner. Vienna's objective now is to increase bednights to 18 million by the year 2020. Congress tourism will also play an important role here, accounting for 12% of the total volume of bednights in 2015. 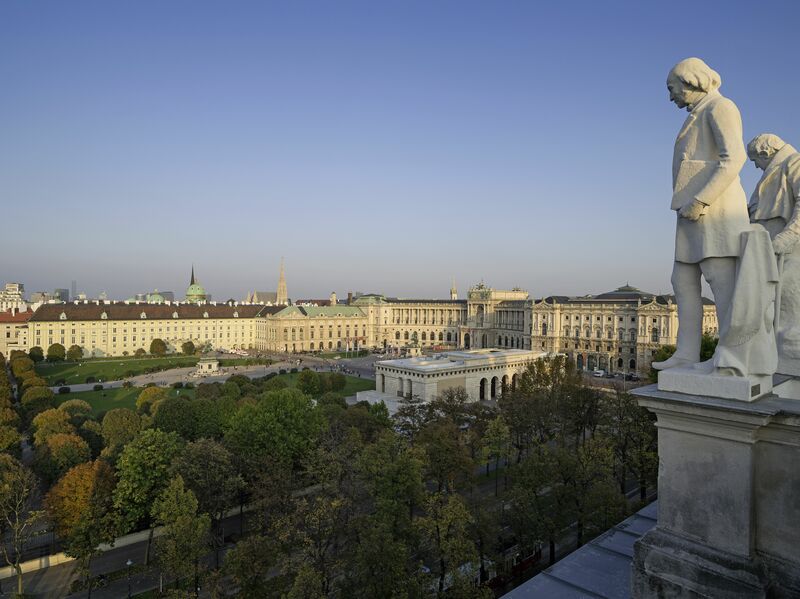 Some 3,700 congresses, corporate events and incentives were held in Vienna last year � a new record. WHEN SHOULD YOU BOOK A CRUISE? 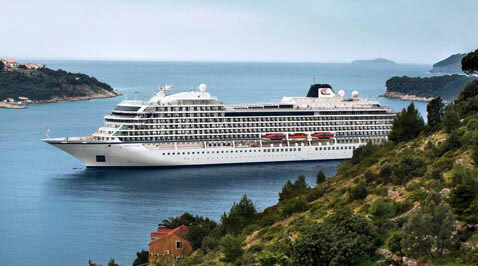 Booking Your Cruise on the right day of the week can be very cost effective! Not unlike the best day to book an airline ticket or perfect time to book a summer hotel, there's now reason to believe there is an ideal time to book your next great cruise deal as well. According to a study from cruisewatch.com, the search engine for cruise deals (and price deals), fares dip 17 percent on Thursdays. Collected ata, based on an analysis of more than 600,000 cruise price reductions over the past few years, showed that there were more than twice as many price drops on Thursdays than there were on Sunday, considered to be the slowest day for bookings. Many of us only get to booking travel on weekends, however, there is only a 13.5 percent drop on Saturday and 7.8 percent drop on Sundays. Wednesday is considered the priciest day of the week to book your cruise. Supposedly, thirty-four percent additional price hikes happen on Wednesday.